Since the summer of 2014 Joao Cavaco has run a very successful Elite Young Riders Club on every Wednesday night, specialising in Dressage. 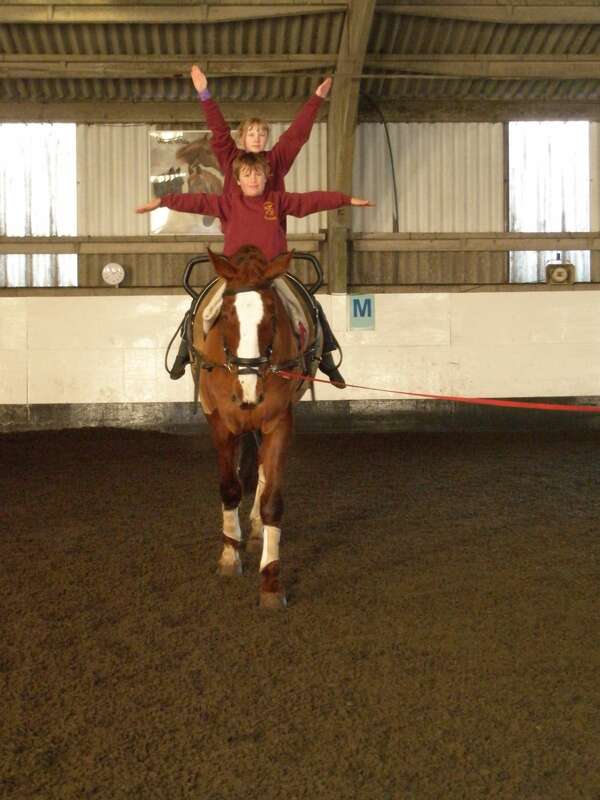 The club teaches Young Riders how to develop their way of riding, whilst teaching some of our Advanced School Horses and ponies to develop within their paces and movement. Joao teaches in a very unique way to get the children to progress and enjoy Dressage. As Joao is very busy and doesn’t usually teach children it is a fantastic opportunity to learn from a professional and an Advanced Instructor. All riders need to be of a certain level, and need to be willing to listen to criticism and advice. Tariq, Toby and Millie are main horses within the group, however other horses and ponies are frequently used. “My name is Jack and I have only been riding properly for 3 years (unlike some of the others) since then I have learned a lot very quickly . I started riding with João in the Autumn of 2013; riding Tariq and I couldn’t even canter ! After training with Joao most days I improved and by the time I got Faffa ( my own horse) I could ride canter, medium trots , changes and lateral work on Tariq- quite different to my first lesson. I was the first member of the Elite Young riders team, soon joined by Zak and Libby, the group made me realise ‘dressage is not just you and your horse, its about your team’ . In the summer of 2014 my parents and I went to Portugal with João, to find a horse! We looked around many horses ranging from young horses to Grand Prix horses; we bought a 5 year old Stallion called Fanfarrão (FAFFA), he had been trained in Portugal all his life, so wasn’t used to English people, places and the climate (especially when he first saw snow). Over the previous year I have been taking Faffa out to BD competitions and BYRDS (British Young Riders Dressage Scheme) in which we have learn a lot and achieved a lot including county competitions. In the future I would like to take Faffa through the levels and progress with him and my riding. I also get amazing opportunities to ride Tina’s amazing horses- and have lessons with her. However, João is the main reason I am where I am today within horses; he has taught, trained, coached and guided me through my equestrian career so far. Xairel is our newest member of our Lusitano Stallion Team. Xairel has competed up to PSG in Spain and also has enjoyed hacking and hunting. Xairel is proving popular with our staff team with his easy going nature. Xairel is a responsive and sensitive ride who shows a talent for lateral work.